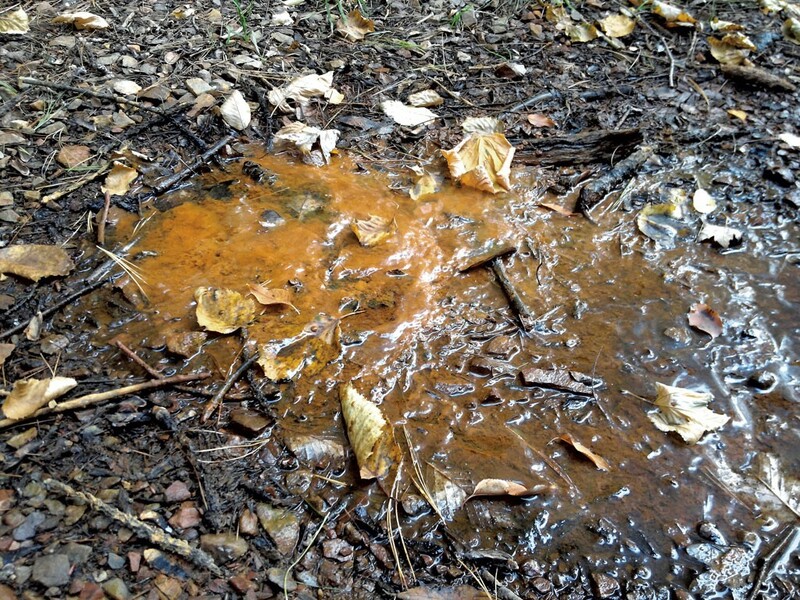 WTF: What's the Orange Ooze in Leddy Park? Just south of the ice rink in Burlington's Leddy Park, a dirt path curves through the woods toward a small beach. It's a short, pleasant walk, especially when the sun glints off Lake Champlain, visible through the trees. The only thing that mars the placid scene is a curious, icky puddle of oily-looking, rust-colored ooze that burbles up from the ground, issuing a slow but steady trickle lakeward. WTF is this stuff? And should we be worried about it — or at least grossed out? The ooze may look like hazardous waste, or perhaps the output of some bizarre curry-sauce aquifer, but it's actually a harmless, naturally occurring substance that is rendered somewhat yuckier-looking by opportunistic bacteria. "It's just groundwater," says Greg Johnson, a stormwater and geographic information systems technician with Burlington's Department of Public Works. That groundwater, Johnson says, flows through the soil, leaching out some of its constituent minerals. "We're not exactly sure of the compounds in the soil, but it's got to be some kind of iron. The water filters through the soil and pumps out, and it'll have that really nasty, toxic-looking reddish color." The puddle itself, where the water wells up before trickling down the path to the lake, is called a seep, a hydrological feature found all over the globe. Aided by natural depressions in the terrain, water pools in the seep, where its minerals become concentrated. What looks like rust is, in fact, rust: familiar old iron oxide, chemically identical to the stuff on that shovel you accidentally left outside last winter. The seep in Leddy Park is conspicuous, but it's hardly the only one within city limits. Johnson notes that much of the bedrock in the Hill Section neighborhood is fairly close to the surface, a geological characteristic that tends to create seeps. But there's something else in the rusty water of the Leddy Park seep (and many others): bacteria. While the organisms do cause the oil-slick-like sheen on the liquid's surface, they don't do so by depositing waste products there. Rather, the sheen is a trick of the light, according to Breck Bowden, professor of watershed science and planning at the University of Vermont's Rubenstein School of Environment and Natural Resources. A simplified explanation is that light refracts off the bacteria much as it might move through a prism, giving the liquid an oily appearance. We wouldn't dream of spreading iron or manganese on our sandwiches, but, for certain bacteria, such elements constitute a nutritious repast. According to Bowden, the most common genera of iron-oxidizing bacteria in freshwater environments, such as that of Leddy Park, are Gallionella and Leptothrix. The iron-and-bacteria soup, while unappetizing, "is perfectly harmless and nontoxic," says Bowden. Nor should we worry about the effects of this liquid leaching into Lake Champlain. Bowden says any impact from this single seep would be negligible: "There'd have to be hundreds or thousands of those [seeps] dripping into Lake Champlain to have an impact." In fact, Bowden says, while the appearance of groundwater seeps may be alarming, a whole lot of geological, hydrological and mineralogical activity beneath the soil escapes our attention — and we needn't worry about that, either. Bowden's own fieldwork in the Arctic has suggested to him that the subterranean cycling of minerals — from soil to groundwater to bacteria and back — is highly important to a landscape's overall health. A seep, even a discolored one, is generally no reason for concern, but that doesn't mean you shouldn't learn what you can about its composition. A generally effective, if unscientific, method of determining the identity of the liquid in a seep is to poke a stick into it. If the material in the water breaks up into a flaky particulate, the liquid is likely iron-bearing groundwater. If the stuff adheres to the stick like lightweight oil, the water may contain contaminants. And that might warrant contacting a local health officer, using names available from the Vermont Department of Health. For a fee, private testing firms, such as Williston's Analytical Services, can also determine the chemical composition of a water sample. In most cases, though — including at Leddy Park — a seep is likely to be no more than a pooling of iron-bearing groundwater. The stuff is harmless, but don't go slurping it down. Leave that to the bacteria.